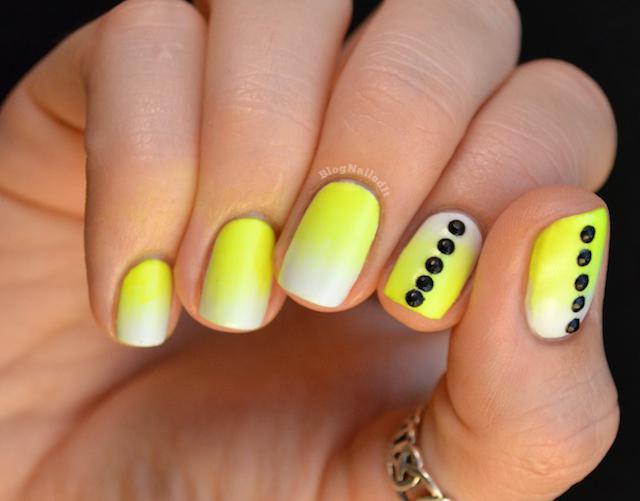 I couldn't get the idea of a neon yellow gradient out of my head all day. It's something I just felt I needed to do as soon as possible. So, I picked two of my all time favorite colors: Yellow Polka Dot Bikini (China Glaze) and My Boyfriend Scales Walls (OPI). I know I know, that damn greyish white has made several appearances recently (here, here, here and here), but it really deserves the spotlight. It's a perfect color. I wanted to add something, but since I had done polka dots last night, I wanted to do something different, but keep it round. The trigger finger idea came about only because my supply of black rhinestones wouldn't have been enough to cover all 10 fingers. A nifty solution for the thrifty. This is so cute I love the rhinestones! The rhinestones are the perfect touch! That is so awesome. The gradient turned out perfect, too! Love it! Anything with neon is awesome! I really like the gradient!